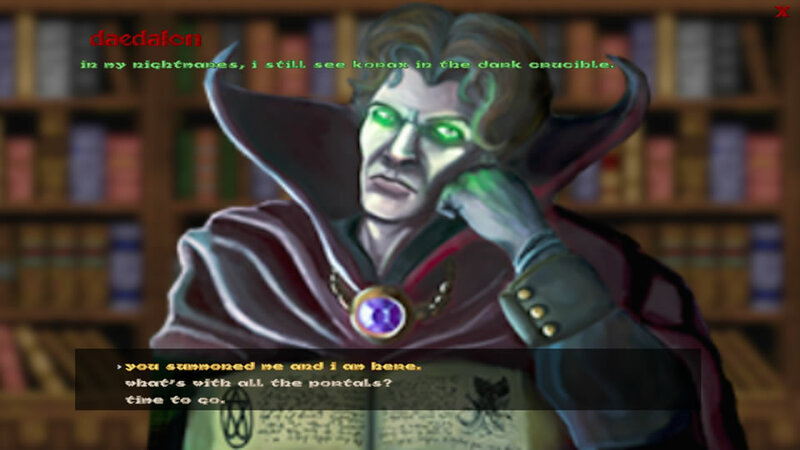 Korax’ Heritage: Scattered Evil is the first game released based on KoraxRPG (or KRPG for short), a cross-breed between a first person shooter and a role playing game, set in the world of Hexen. 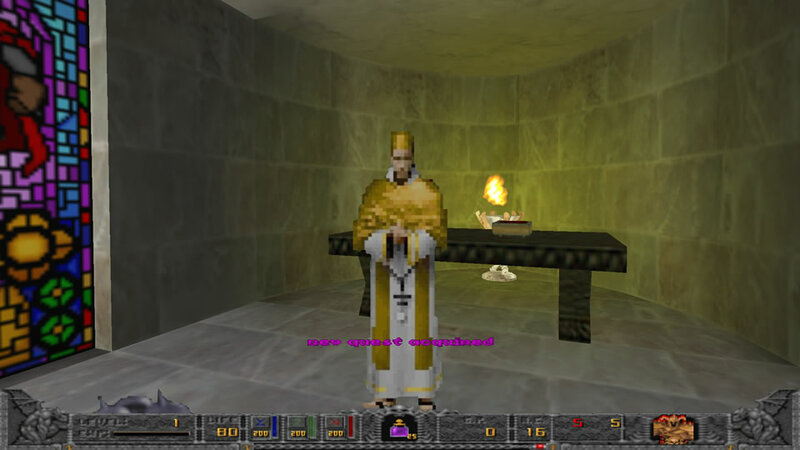 In addition to the 3D movement, exploration and fighting of the original Hexen, you can travel around the world in different ways and talk to non player characters (NPCs) to learn new spells, acquire new weapons, buy useful items and more. In addition, you get experience for killing monsters and finishing quests. After earning sufficient experience, you level up, gaining more power. Your deeds as well as any useful information you come upon in your travels are automatically recorded in your journal. It’s been three months since Korax’ defeat in the Dark Crucible. The sole survivor of the ordeals, the mage Daedalon, withdrew into an abandoned tower in the wilds of a faraway southern province called Charybdea. Born and raised in Charybdea, which was mostly untouched by the evil hordes, you spent this last year completing your training with your order. Now that you have graduated, you are eager to strike out on a grand adventure of your own. You contemplate where to go, when a courier delivers a sealed letter to your cubicle, with an invitation from Daedalon. You embark on the journey to his tower, but decide to take a shortcut through the Praevian Forest to save time. After a few hours, you realize you are lost and decide to take a short break in the clearing ahead. As you step out from behind the last tree into the clearing, you realize you are not alone. An ettin is standing in the middle of the clearing, luckily for you looking into the opposite direction, busy with a cauldron hung over a campfire. After downloading the ZIP file, extract its contents into a folder of your choice while preserving the subfolder structure. 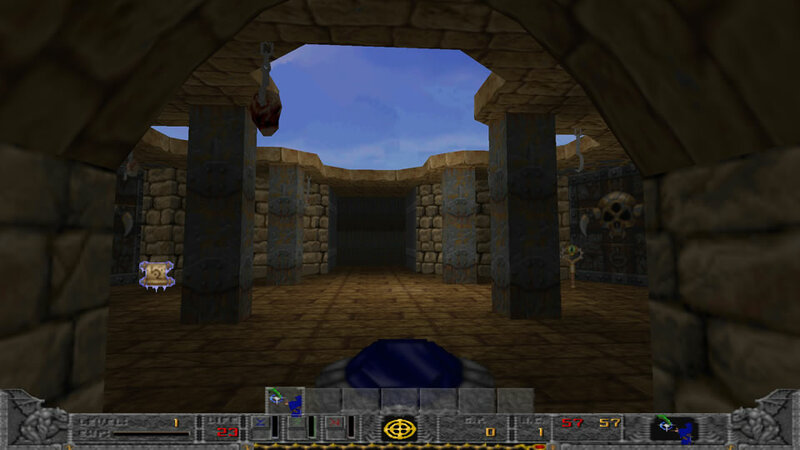 Then copy a version 1.1 hexen.wad into the main game folder. To start the game, double-click on the file “ScatteredEvil.bat” in the main game folder. If you have any issues with starting up or running the game, check the chapter “Troubleshooting” towards the end of this document for solutions. You can invoke the main menu any time (except during conversations and while perusing the journal) by pressing the Esc key. You can navigate menu items with either the mouse cursor or using the arrow keys and select an item by either clicking on it or pressing Enter. Includes options to start a new game, load a saved game, save a game in progress or end a game in progress. Includes a number of submenus to reconfigure key bindings and tune some of the visual, audio, input or gameplay settings. Displays two help screens with the default key bindings. Exits the game upon confirmation. To start a new game, invoke the main menu, select “single player”, then select “new game”. You will be led through a 7-step process to create your new character. 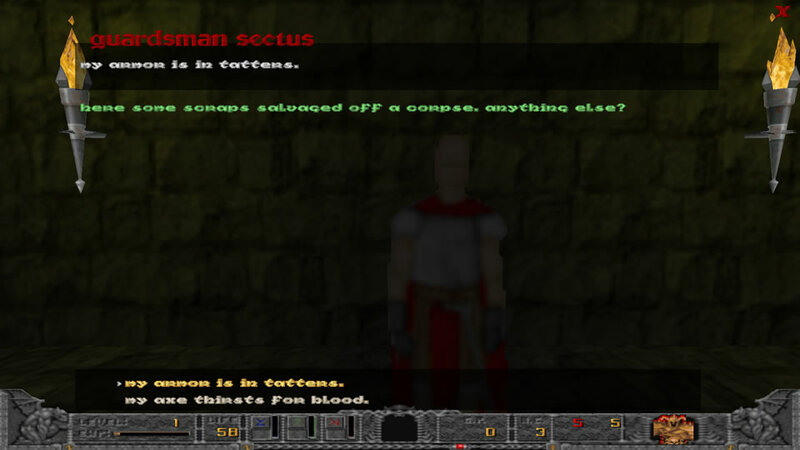 This is at the core of the unique KRPG experience: you can tailor the game’s behaviour to your playstyle. The higher the complexity setting, the more you need to explore, the more minute details of your character you need to manage, the more riddles you need to solve and the more you need to care about people’s feelings; the lower the setting, the more you can just concentrate on the business of killing monsters. This defines your character’s attitude towards law and order (lawful, neutral, chaotic). This defines your character’s view on good versus evil (good, neutral, evil). In combination with the previous alignment, it can have great influence on how the world’s denizens view your character. Here you can pick one of the player classes. They are identical to the ones in Hexen and handle similarly, but with a much stronger emphasis on their core strengths and weaknesses: the fighter becomes extremely strong in melee, the cleric can heal lots of damage fast, and the mage has a vast number of spells at his disposal. Here you can name your character and fine tune the colors of his clothes. This step allows you to define the starting score of your abilities and lets you reroll until you find a combination to your liking (or just take the default build). Strength: Increases the power of melee (physical) attacks. Increases movement speed. Dexterity: Increases the power of ranged (physical) attacks. Increases the speed of physical attacks (melee and ranged). Constitution: Increases hit point gain when leveling up. Increases the amount of damage absorbed by armor. Intelligence: Increases the power of spells. Wisdom: Reduces the amount of mana needed to cast a spell or fire a weapon. Charisma: Increases the size and the regeneration rate of the battle rage/faith/magic pool. Player movement differs in three small ways from that of other DOOM source port games (even vanilla Vavoom). You can crawl on all fours as usual by pressing and holding the crouch key (C or NumPad 1), but there is also the option to fine-tune your character’s height at intermediate levels and move around in a slightly slouchy manner, without having to hold the crouch key. To achieve this, lightly tap the crouch key once or a few times, until you lock in the desired height (pressing the key too many times will make you squat, a stance from which you automatically stand up again when releasing the crouch key). To climb a ladder, keep walking forward by holding down the assigned key (by default the up arrow key or W). If you release the movement key while climbing a ladder, you will let go of the ladder and drop down. There is no downward travel on ladders; if you want to get to the lower floor, just jump down. To open a door, just push against it. This works no matter what direction you are facing, i.e. you can kick open a door behind you while backing away from and firing at a horde of monsters charging towards you. The status bar shows the most relevant character information at a glance. In full screen mode, the status bar is replaced by a minimalistic HUD in the lower right corner of the screen. In the middle column, to the left of the mana counters the mana color indicator lights up if your currently equipped weapon or spell is using that kind of mana. As time passes, your character’s belly starts to rumble. The hunger status indicator will slowly fill up and once it reaches 100%, a bright red exclamation mark appears to indicate that the character is in the hungry state. While hungry, your character gains a reduced amount of experience (half the usual amount on Standard RPG complexity, a quarter of the usual amount on Old School complexity). The fighter gets hungry the fastest, the mage the slowest. Hunger grows faster on Old School complexity. To still your character’s hunger, look for an establishment that serves food. Note: This feature is disabled when RPG complexity is set to “Off”. Strenuous physical exercise (jumping, climbing, swimming and the like) will cause your character to tire (on Old School complexity, using class abilities also increases fatigue). The fatigue status indicator will slowly fill up and once it reaches 100%, a bright red exclamation mark appears to indicate that the character is in the tired state. 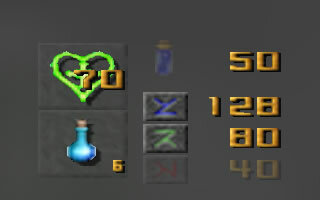 While tired, your character moves, fights and casts slower (3/4 the normal speed on Standard RPG complexity, half the normal speed on Old School complexity). Additionally, the fighter can’t use his martial skills. The mage tires the fastest, the fighter the slowest. To regain your vigor, visit an inn and rent a room to get a good night’s sleep. Once you exit a location connected to the travel map (when starting a new game, it’s leaving the first town by walking down the road), the game displays the travel map interface, a hand-drawn depiction of the world. A red dot on the map shows your location in the world and the blue arrows show the direction(s) you can travel in. To pick a direction, press the corresponding arrow key and when the blue arrow starts blinking, press Enter. As you start traveling, the red dot representing your location starts moving in the indicated direction, trailed by a red line showing your recent progress. Once you arrive at your next destinaton, you will be asked if you wish to enter the location you’ve just reached. You may accept, or decline and continue traveling. Some locations offer faster travel methods than just hoofing it. Coastal towns offer a boat service to other coastal towns. Talk to a boatswain to arrange passage. There is a coach service between large cities. Talk to a driver at a coach station to arrange passage. Talk to a mage at a mage tower to attune to that place, then use an inventory item called Scroll of Recall any time to teleport back to that tower. The three mage towers in the wilds of Charybdea are linked to each other with teleports. Just step into a portal to instantly reappear in another tower. This last mode of travel is only available to members of the Arcanum. 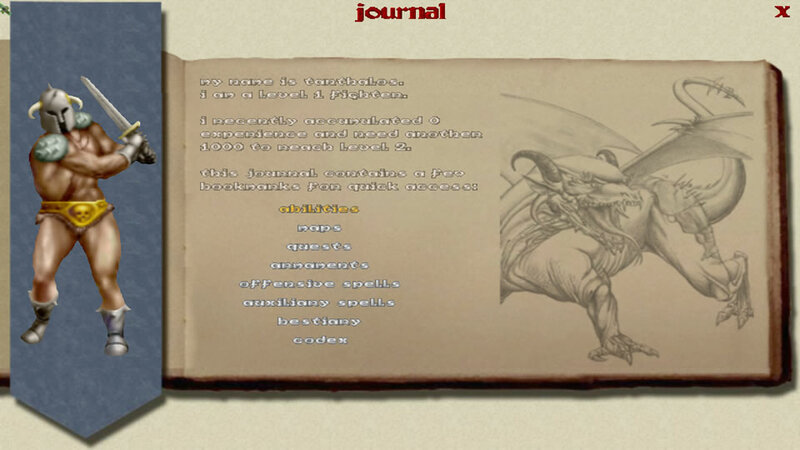 You can access the journal during play by pressing the J key and navigate its content the same way as the game menus. This page allows you to increase your ability scores with the points you receive whenever you level up. This section allows you to collect maps of different subregions and cities, purchased from vendors. On the subregion maps, the journal will automatically add annotations when you visit places and accept quests. Sometimes when you talk to an NPC and accept his/her task, you receive a trackable quest. To make sure you don’t miss having picked up a quest, a message pops up upon exiting the current conversation. Once you feel you have fulfilled the quest requirements, return to the quest giver NPC and talk to him/her again. 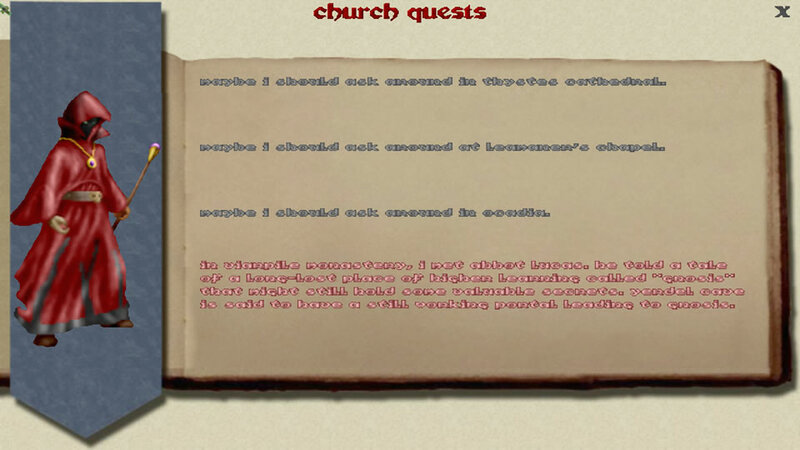 You will receive some kind of quest reward and the quest description in the journal will turn to a faded light brown color. Quests you haven’t yet accepted are not displayed. Depending on the RPG complexity setting, there is a more or less detailed hint directing you towards the questgiver. This section lists all weapons you have, along with a short description of them. Depending on the RPG complexity setting, there is a more or less detailed hint on where and how to obtain any weapons you don’t yet have. This section lists all offensive spells you know, along with a short description of them. Depending on the RPG complexity setting, there is a more or less detailed hint on where and how to obtain any spells you don’t yet know. This section lists all class abilities you know, along with a short description of them. Depending on the RPG complexity setting, there is a more or less detailed hint on where and how to learn any abilities you don’t yet know. Depending on the class, this section has a different name in the journal. This section displays information and depictions of the monsters you will face on your journey. Collecting these information pages also increases the damage your weapons do to monsters. This section contains information you collect from specialists around the world. Acquiring a codex page will also enhance your mind, allowing you to cast spells of greater power. Each class starts with the weapon in the first slot (which doesn’t use mana) and can obtain the weapon for the second slot (which uses blue mana) from his order’s representative in the first town after starting a new game. After that, the player needs to complete quests to obtain the remaining weapons. You need to complete quests to learn the spells available to your class. Each class has a category of abilities: the mage sings cantrips, the cleric recites prayers and the fighter hones his martial skills. To pick a class ability for the active slot, press one of the spellstrip navigator keys (by default [ for left and ] for right) and then move the selection bracket left or right until you highlight the ability you want to have active. You can invoke the ability any time by either clicking the right mouse button or pressing Numpad /. Each class has a different number of abilities, using their class specific resource (battle rage/faith/magic). The first ability on the list for each class is automatically obtained at game start, the remaining ones are taught by a class trainer in the corresponding order base in Thystes. The inventory is now two-dimensional. Use the Numpad arrow keys (8 for up, 2 for down, 4 for left and 6 for right) to navigate in all directions. To use the currently selected inventory item, click the middle mouse button or press Numpad 5. To interact with a friendly NPC, walk up to them and press the use key (Enter or Space). To pick a dialogue option, highlight it using the up and down arrow keys and then press Enter. By default, the text color signifies who is currently talking: green for NPC lines and white for your lines. A setting in the gameplay options menu allows you to explicitly display the speaker’s name, like in the screenshot below. Another setting allows you to switch conversation sounds on or off. Sometimes there is a narrator comment, this is signified by a faded salmon color. Buying items from vendors works similar to talking to people: you find a merchant and choose the conversation option that offers the wares you seek to purchase, provided you have enough money to complete the transaction. You can see the amount of crowns you possess in the journal and by opening your inventory. Prices may vary from region to region and merchant to merchant. Coastal warehouses often offer substantive discounts on bulk purchases. Some merchants might be willing to buy certain items from your excess inventory. Look for a conversation option mentioning it. Once the game window is in focus again, press the Alt key and mouselook should start working again. The game defaults to the OpenGL renderer; if you’d like to try the deprecated Direct3D renderer, open ScatteredEvil.bat in a text editor and replace “-opengl” with “-d3d”. If you get an error message on startup saying “Game mode indeterminate”, this means the game couldn’t find a valid Hexen.wad in the directory where Vavoom.exe resides. The game is set to run at 1920×1080 by default. To set it to a different resolution before starting up the game, edit the file “config.cfg” in the game subfolder “koraxrpg” and modify the values for “screen_height” and “screen_width”. Depending on the size and complexity of the geometry and the number of light sources, some maps can take fairly long to load. The range is literally between less than one second and more than one minute. Maps with the longest load times: Donas Monument, the town of Ocadia, the outdoor areas in the eastern desert (Ruins of Nisisil, Pyramid of Krylu, Is’hine Oasis). There are a couple of tricks to deal with NPCs blocking your way, first and foremost jumping over them if there is enough vertical space. This can be somewhat tricky on slopes (see the next entry). You can also stand your ground, blocking the NPC from going in a certain direction. After a brief hesitation, they’ll turn around and walk away in another direction. If you press the jump key while moving up- or downward on a slope, the game ignores your request to jump. What works however is stopping on the slope, then pressing the jump key and then the forward key. If you pull down the console (by pressing the ~ key), it’ll show the message(s) previously displayed in the center of the screen. There is always a chance an inadequately tested conversation flow gets the player stuck in a loop. To exit such a conversation, pull down the console by pressing the ~ key, then press ~ again to return to the game. Note that this can break the NPC’s conversation (including quest status), so only use it if irretrievably stuck. This game has many moving parts and isn’t guaranteed to be bug free. To avoid losing a significant amount of game progress, we recommend you keep several savegames and rotate them. A flexible setup is to have one savegame whenever you are in a town, one whenever you enter a new dungeon, and a third one to save throughout the dungeon. Any bugs you find, please report them to our Bug Tracker at www.koraxheritage.com/bug-tracker. Due to this mod having been in development for nearly two decades, it’s easily possible that some credits are incomplete. Let us know of any corrections or additions through comments at www.korax-heritage.com. 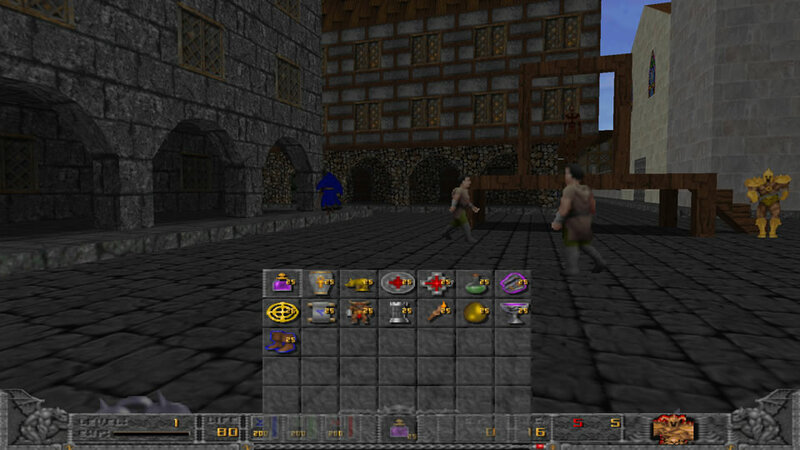 Scattered Evil is based on Raven Software’s Hexen, using many of its original assets. 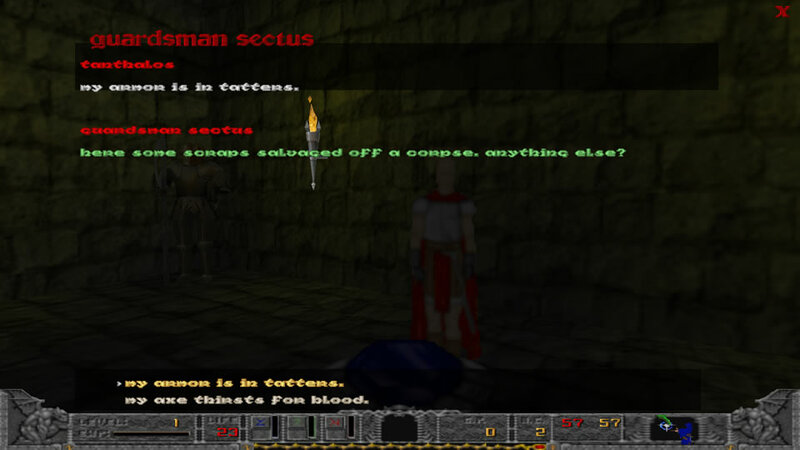 It also uses a lot of 2D art, some 3D models and a few sounds from Heretic, Heretic II and Hexen II. The 2D animations and sounds for some of the weapons and spells are based upon the artwork of Capstone’s Witchaven. 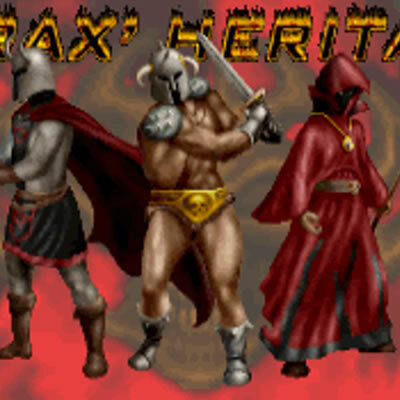 The generic peasant sprites were copied from Rogue Entertainment’s Strife. The majority of noncommercial assets are released under a Creative Commons or a GNU license. See the attribution list for more details.